【Incredible HD Images and Videos】-Due to its 16 MP crystal clear image resolution and 1080P HD video with clear sound, the trail camera is able to present you with every breathtaking moment of wildlife or every specific details you want. 【Excellent Nighttime Capture Performance】-Equipped with fully automatic IR filter and IR LEDs, the hunting camera won't produce any bright flash that may be found by people or wild animals.So it does excellent job in nighttime shooting, providing clearer and sharper pictures and videos for you to satisfy all your need! 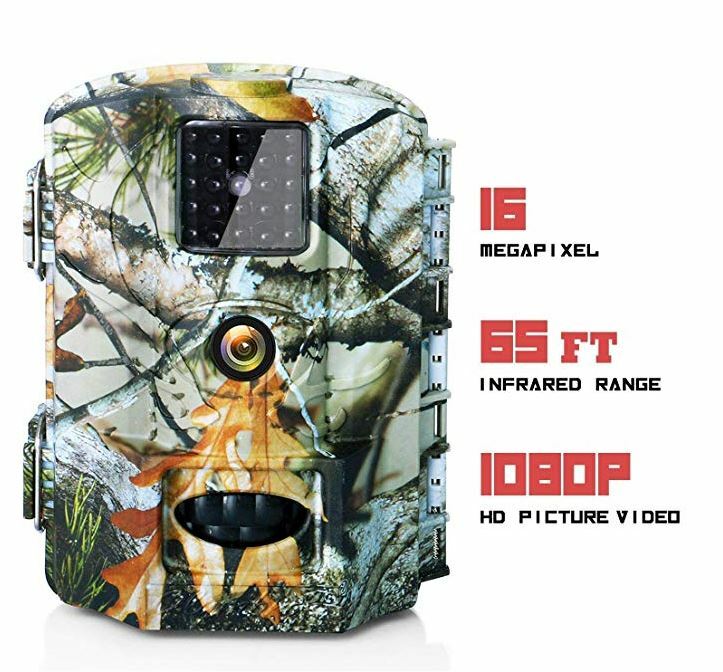 【[Detection Range & Lightning Triggers】-Engineered with innovative three detection sensors,the trail camera can provide you with the 110° wide detection angle and 65ft effective detection range.Plus its impressive lightning 0.6 seconds trigger time,it won't miss any detected action or stirring moment,assuring you of the best supervising experience. 【Muiltifunction & Impressive Waterproof Design】-In view of its ultra-sturdy case with IP65 waterproof design and super-long working life,the camera can stand up to tough working environment,so it caters to both indoor and outdoor applications.You can use it for farm & home security,wildlife monitoring and scouting game. 【Informative & User-Friendly Device】1 minute set-up and go! It can be installed anywhere you want either on ceiling or tress,plus each video and images captured by the camera are determined and labeled with stamp information like moon phase,serial number,temperature (℃&℉), date/time.